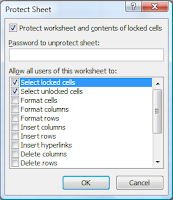 How to lock cell, column or row in worksheet, 2007? 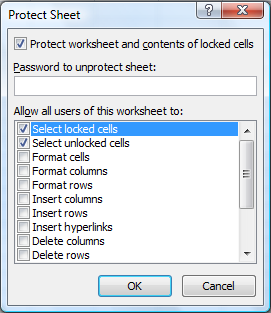 Select the cells that you want to remain unprotected. 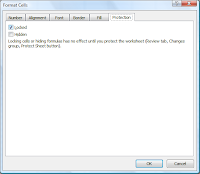 To select nonadjacent (noncontiguous) cells, hold down CTRL and click the cells that are to remain unprotected. and then click the Protection tab. Click to clear the Locked check box and click OK.
On the Home menu, click to Format submenu, and then click Protect Sheet…. Option, Type a password if you want one, and then click OK. Select the entire worksheet by clicking the Select All button (the gray rectangle in the upper-left corner of the worksheet where the row 1 and column A headings meet), or by pressing CTRL+A or CTRL+SHIFT+SPACEBAR. On the Home menu, click Format submenu, click Format Cells… option, and then click the Protection tab. Click to clear the Locked check box and click OK. Select the cells that you want to protect. 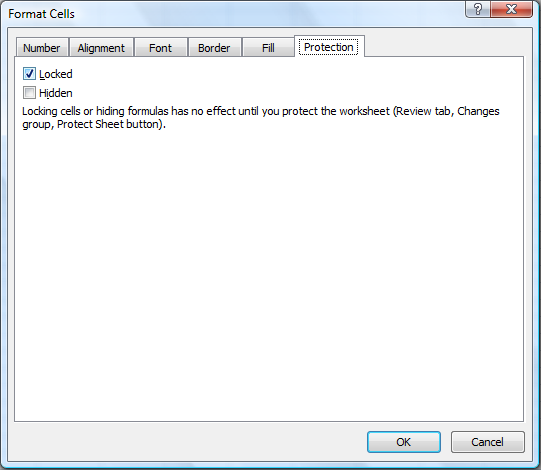 To select nonadjacent (noncontiguous) cells, hold down CTRL and click the cells that you want to protect. On the Home menu, click Format submenu, click Format Cells… option, and then click the Protection tab. Click to select the Locked check box, and then click OK.
You will find that you can only type data in the cells that you selected. Note: You can reach Protect Sheet... option from Review menu also, see the below figures.